Q62. Do You Prefer Outdoor Activities to Indoor Activities? Support 1: Outdoor activities usually provide an avenue to interact with people in a more relaxed setting thus allowing for closer interaction. Support 2: I get to interact with nature and see more places. Support 3: There can help me stay fit. Thesis: Although some activities are best suited to be done indoors, I always prefer it if they could be done outdoors. Life is truly multifaceted. This means that there will always be need for people to engage in different activities as they interact with others or to different goals.These activities need a venue and could be either indoors or outdoors. Obviously, some activities are meant be performed outdoors while others are meant to be performed indoors. Nonetheless, given an option, I would prefer to engage in outdoor activities and here are my reasons. Outdoor activities usually provide an avenue to interact with people in a more relaxed setting thus allowing for closer interaction. This means that it is easier to make friends when I am in an outdoor setting since I would probably be able to find a common topic like the weather to start a conversation. There is also more to see when engaging in outdoor activities; this also very helpful when trying to keep conversations going. I also prefer outdoor activities because I get to interact with nature and see more places. If I were to just stay indoors, I would never explore the world and know what my environment holds. Obviously, this would not be a happy and fulfilling life. For instance, I could spent time outdoors and lust relax as I enjoy the cool breeze or as I listen to the birds or just watch them. Although some activities are best suited to be done indoors, I always prefer it if rhev could done outdoors. It is more thrilling to do things outdoors as I breathe fresh air and talk to friends without feeling constricted by a building. 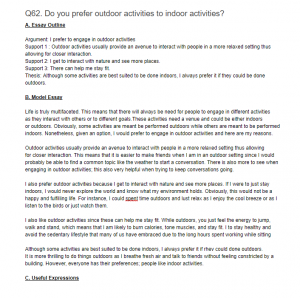 However, everyone has their preferences; people like indoor activities.